Green Thai Curry with Chicken (Gaeng Kiaw Wan Gai) | Love.Food.Asia. If you love Thai Food we are sure you already know (and love) this curry. 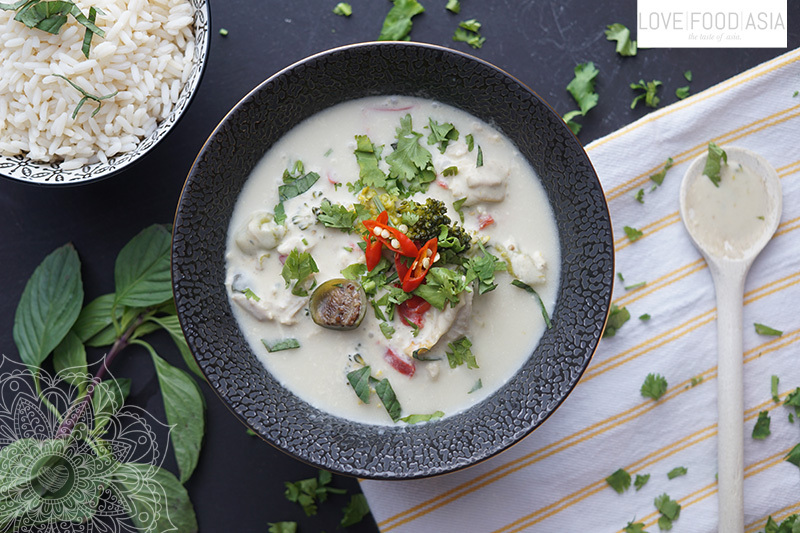 The Green Thai Curry (Gaeng Kiaw Wan Gai) is one of our favorite Thai currys. It is spicy, aromatic, sweet and savory at the same time. This curry is so delicious, specially when it’s served with steaming white rice. The green color in the curry paste from fresh green chilies, hence the name green curry. Here is our recipe for Homemade Green Curry Paste. It gives this Thai classic the perfect taste. You also can use chicken breast for this curry but the chicken pieces with bones make the green curry even more tasty. In the beginning heat coconut cream in a pot or wok over medium heat until boiling. Add green curry paste and kaffir lime leaves and stir well over low heat for about 10-15 minutes or until just glossy. Now it´s time to add the chicken pieces. Boil everything for another 5 minutes. Pour in coconut milk and bring to a boil. Add Broccoli and Thai eggplants and continuing cooking for another few minutes until cooked through. Remove from the heat and stir in palm sugar. Season with fish sauce. Garnish with Thai basil leaves and fresh Thai chilis.